The city Vranov nad Topľou is district capital seat. It is located in the northwestern spur of Východoslovenská lowland, under eastern slopes of Slanské vrchy, in the area of upper Zemplín. It is spread in the valley of rivers Topľa and Ondava in an area of 31,10km, 22 970 habitants are registered in the city. The city had developed from an original Slavic settlement. Medieval settlement Vranov was a part of castle estate Čičva, which became a property of a noble Rainold from Rozhanovce. The first written notice about Vranov is indirectly related in this year. From the 15th century Vranov developed as a small city. It obtained various privileges, it made up writings with seal of the city. It has been using the present coat of arms since 1622. The most precious monument is a late gothic Roman-Catholic church of Birth of the Virgin Mary estabilished as a Franciscan at the end of the 15th century. It was reconstructed in baroque style during 1735-45 after being burnt. Its interior decorated with precious ceiling paintings and carving works has an important value. 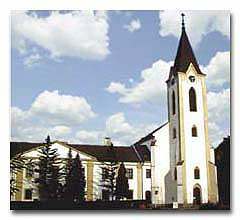 Vranov nad Topľou has an advantageous location for trips to near tourist towns in the district. The main target of tourism and recreation – water dam Domaša is located only 20 km far from the town. The crystal water and beautiful landscapes form outstanding conditions for active recreation with a possibility of going in for water sports equally for native and foreign visitors. Attractive options for active recreation is presented by the Slanské vrchy (mountains), which hide a number of natural and technical concerns of interest. Visitors interested in sports can take advantage of plenty tourist and cyclic tourist paths, possibility of ski running and downhill run in the winter. Out of the traditional cultural and sport events, significance of which goes beyond the regional range, stand out the Marathon of Zemplín – the oldest sport event since 1966 – race placed in the Regional Grand Prix of long-distance runners of East Slovakia region (May), international walking race Vranovská pätnástka (15 km walk) Grand Prix Hi-tec Panasonic Slovakia (August), Zlatý gaštan– a amateur pop song festival (September) and Vranovské zborové slávnosti (June). Every year during the first week of October takes place a traditional fair of Vranov.